Police investigate report of serious sexual assault at camp in George Square. 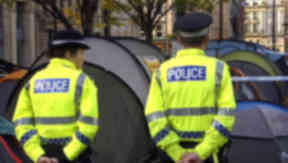 A woman has been raped in a tent at Glasgow's George Square which is the site of an**** anti-capitalist protest camp. The 28-year-old is understood to have been attacked in the tent in the early hours of Wednesday morning. Police said they are looking for two suspects they believe are known to the victim. Detective Inspector Dougie McKinlay said: "We are looking for witnesses to an incident that took place some time between 9pm and midnight last night, where a serious sexual assault occurred on a 28-year-old female within the Occupy Glasgow protest camp." The suspects are described as 20 to 30, both 6ft and of slim build. One had short, spiky blond hair and one had short dark hair, police said. DI McKinlay added: "The victim may have known her attackers, but possibly not by name. We know there were other people in the area at the time and we are appealing for them to come forward." Police believe the victim and suspects had all been staying in the camp site in George Square. The Glasgow protest is part of the global occupy protests which have been taking place in cities around the world following the Occupy Wall Street protest in New York. The protesters are campaigning against the perceived injustices of the global economic system. In Scotland a protest is also being held in Edinburgh's St Andrew Square. In a statement, Occupy Glasgow said: "Occupy Glasgow is shocked and deeply saddened about the alleged sexual assault on one of the individuals that have been co-inhabiting George Square with the separate Occupy Glasgow movement. "Since October 15, Occupy Glasgow have provided free food, shelter and clothing to some individuals who had none of their own and we immensely regret any harm that may have befallen one of these individuals. "We are fully committed to working with Strathclyde Police in their current investigation, and in continued improvements to the provision of safety to occupiers, the homeless and the general public that use George Square." Speaking to STV News, a spokesperson for Occupy Glasgow added: "The camp has taken steps throughout to ensure the personal safety of those involved in Occupy Glasgow. "Occupy Glasgow has a safer spaces policy and has a zero tolerance policy for alcohol and drugs and for violence." Members of Occupy Glasgow are working with police and other agencies to help with the investigation and to improve safety measures for those involved in the protest. Police said the future of the protest camp will be a matter for Glasgow City Council while they continue their investigation. DI McKinlay said the usual police presence will be around the camp on Wednesday night.